Who needs a crystal ball when you have the Pinterest 100 to tell you which home decor trends are going to be big in the New Year? While the annual list covers everything from beauty and food to travel and fashion, the report for 2019 also offers a telling peek at the next big trends to hit the home space. The overarching theme for next year? Color, color, and more color. Alternative uses for paint, rebellious hues, and unexpected greenery are just a few movements leading the way for 2019. Come January, the homebody is ready to take their space into their own hands—be it by painting their parquet floors or introducing new wovens to the walls. Day-to-day DIY projects will also continue to be major, accounting for 83 percent of home searches. Here’s a complete rundown of the top 10 home trends—so you can get in on them before everyone else does. Who said anything about ripping up that gaudy floor tile in the bathroom? Savvy renovators are apparently all for skipping demo day and going straight to the paint job. And while searches for painted floor tiles have seen a +1276% spike, people aren’t just painting their existing floor tiles: They’re creating faux mosaic scenes on their hardwood floors as well. We’re not going to say we called it, but we fell hard for this chic, renter-friendly wall hack earlier this year. Whether you decide to embrace your inner-Mondrian with a boxy, primary color scheme or make a two-toned statement with strong diagonals, pick colors and shapes that speak to you. If you don’t like what you’ve created, you can always start new. Mistakes don’t seem so daunting when you’re not covering all four walls. Pinners are spinning a new yarn—and they’re going beyond the bounds of the traditional wall hanging. With searches for textile art up +1718%, people are craving fabrics that span the entire wall. Just take the woven mural that hangs in Minted founder Mariam Naficy’s serene Napa Valley living room. Her fringy abstract piece is like a large-scale painting come alive. Move over copper and brass, as everyone’s feeling tinspired by this fresh metal. From backsplashes to wallpaper, the soft and silvery makeup of tin will extend instant vintage vibes. We especially love the old-world look of a fully paneled ceiling. Sunny enough to make an impact but neutral enough not to overwhelm the senses, think of mustard yellow as your gateway color to the rainbow. While we’d love to see this dark yellow shine on all four walls, take it for a test run by decorating with it in smaller doses first. Our handy yellow cheat sheet runs through all the dos and don’ts of using the loud hue at home. Things are quite literally looking up for plants in 2019. If you’re not ready to commit to painting your walls, consider introducing color by way of fresh blooms in the meantime. A floor-to-ceiling living garden is the easiest upgrade you can make for a sad display of potted greens. The bolder the better. Tropical leaves, loud florals, and detailed prints aren’t going anywhere soon. 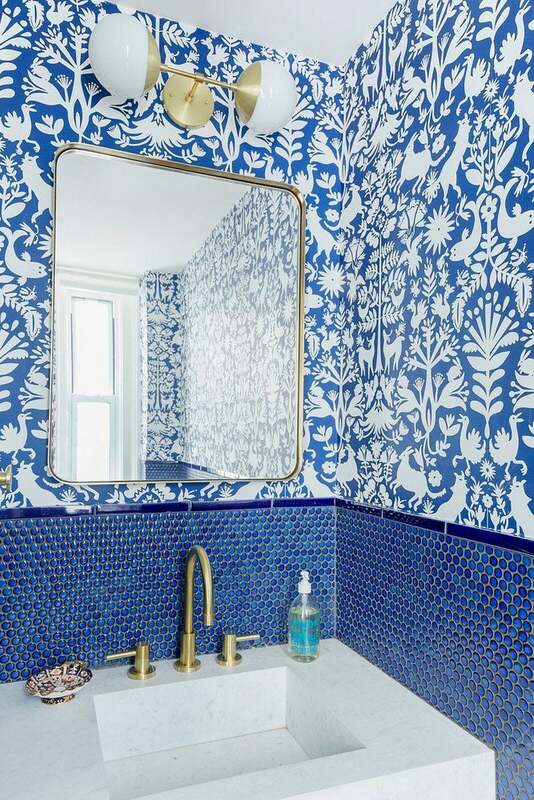 While we’re all for committing to a permanent treatment, with so many chic temporary wallpaper brands out there, we can’t deny the ease of substituting a powerful peel-and-stick. Say goodbye dry skin and stinging eyes, and say hello to a chlorine-free summer. Natural swimming pools (think, lake-like swimming holes that are self-cleaning mini-ecosystems) are experiencing a +262% spike, and we have to admit, our bodies are relieved. Leading a more sustainable lifestyle starts by getting your feet wet. It looks like the trendiest plant of 2018 will reign superior once more in the New Year. For the plant parent that can’t seem to keep their green little ones alive, cacti are the low-maintenance pal you’ve been waiting for. Next year, consider clustering your favorite prickly friends in various groupings to create eye-catching vignettes. Sleek indoor and outdoor fireplaces are heating up with an increasing spike of +763%. Vintage hearths, tiled facades, and red-hot mantel decor are just the beginning for the blaze we hope burns all year.